Abstract interpretation based analysis in PLAI is implemented in a parametric fashion: there are four available fixpoint computation algorithms for the analysis which can be used with several abstract domains. Module plai is in charge of interfacing with the rest of CiaoPP. Modules tarjan, normalize, and transform support the preprocessing needed for analysis: identify strongly connected components, normalize the program (if required), and assert it in a format suitable for analysis, respectively. Module plai_db stores the final results of analysis. Module trust handles the assertions used during analysis and module domains interfaces to the domain-dependent operations. Module fixpo_plai implements the classical top-down fixpoint algorithm of PLAI. In the figure, it represents several other fixpoint algorithms available, namely: fixpo_del for delay analysis, and fixpo_dd and fixpo_di for incremental analysis. Module re_analysis supports the recovery of analysis information after transformation of the source program. 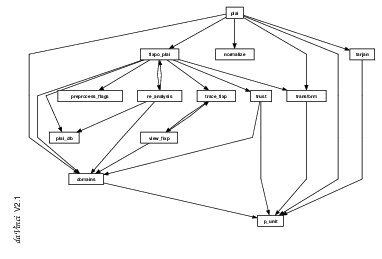 Modules trace_fixp and view_fixp implement tracing of the analysis procedure, including a graphic visualization of the and-or graph being constructed during analysis.